I hear it from people I meet on the train, in places of work or entertainment: Russians, but for a few exceptions, do not engage politically; they make poor citizens. Yet I cannot but be struck with the plastic notion of engagement. When Theodore Roosevelt encouraged the creation of parks in the United States, he saw it as a manifestation of civic stewardship, and I have long admired the tasteful realizations of American park rangers – steps, benches and paths – and their pristine condition. I sense something similar here, but in an urban setting. Russian parks could not be so beautiful but for the willing participation of their many visitors. As often as I can, I mingle in the Summer Garden, the Tauride Gardens and the Mikhailovsky Gardens with thousand of others: families, old people, and the young. As the first autumn leaves fall they are lovingly gathered in little heaps, before disappearing. Some flowers are cut to the ground, others left to die on the spot. There is not one piece of paper on the ground and countless waste paper baskets tastefully placed in stone urns, not one plastic bottle thrown on the lawn, no loud music. All around me, animated conversations, children running around and playing on slides and in sandboxes, and walkers having a cup of tea make me feel happy and safe. I do not sense fear or constraint. We are on shared space, which elicits respect. In Russia in Search of Itself, James H. Billington celebrates his “mentor-colleague” Dmitry Likhachev, a leading expert on Moscow’s religious art and an important moral influence on reforming Russian leaders during the 1980s and 1990s (Billington, 2004, 63). Likhachev’s last major work, The Poetry of Gardens, celebrated his own lifelong experience of therapeutic, everyday interaction with the natural world. It was the parks, not the palaces of his beloved St. Petersburg that inspired him, just as the natural beauty of Solovetsky Island had sustained him during his long ordeal in the gulag. I still remember discovering a French translation of “The Ugly American” on my mother’s bedside table in my early mid-teen in Switzerland. I read some pages feeling slightly puzzled. Yet it confirmed my vague impressions of the Americans as a rather uncouth people, monolingual of course, and permanently foreign to the countries they visited. As a multilingual Swiss-born American, there is nothing worse for me than the prospect of becoming the “ugly American”. And yet am I not one in Russia? For the first two weeks in Saint Petersburg I cannot even be minimally polite in the stores: for simplicity’s sake I adopt rather familiar Russian terms for hullo and good bye. I quickly realize that this is not the way people address me. I finally graduate to slightly more complicated and usual forms of address. Sometime it takes courage just to get out of the door, as I know that I am going, once more, to feel foolish butchering the little Russian I am acquiring. And yet I must. It is not that Russians are not very forgiving. New acquaintances apologize for young Russians not speaking English in the middle of town. No, I respond, it is up to me to adjust, not up to them to adjust to me. Of course, this is more complex. If I do not like American monolingualism, why should I be more accepting of Russian monolingualism, regardless of my situation? I almost refused the Fulbright fellowship because of my ignorance of things Russian. But then I was facing a paradox: I do not want to represent the US in a country I know so little about fearing I shall do a poor job of it. On the other hand this is a unique opportunity to get to know Russia. Of course, I accept. This is as much a question of pride as of knowledge: I am partly reduced to the level of a still illiterate child. Yes, I can now read the Cyrillic characters, but this is just the beginning. More often than not, words are not pronounced the way I expect, and so it is one thing to whisper in my head some unknown street name, another to say it correctly. Fortunately in the middle of town names of major streets are indicated clearly in Cyrillic and Latin characters, a helpful pedagogical tool as well as a practical help. Meanwhile I do tandem lessons, one hour in French and one hour in Russian, with a new friend. She is an excellent teacher of Russian, but initially I can hardly get one word of French out of her mouth although this is a very intelligent woman who studied French 7 years in school and knows a lot. Perhaps, like me, she cannot bear to do things less than well. How I sympathize. Pride precedes the fall, but it shall not stop us. Do the European Union and Russia share a similar difficulty in coming to terms with the memories of their political origins? This question comes up at the end of my second class session on The Politics of European Integration with 5 Russian Masters and PhD students at the European University of Saint Petersburg. We are discussing whether Jean Monnet, one of the EU founders, was primarily a technocrat, as is often argued, or a man more concerned with founding a new kind of European politics. After reading a chapter of Monnet’s Memoirs, one student comments that he could be compared to the Aristotle of European integration. Others protest that this comparison is overblown. I argue that the memory of Monnet as a technocrat, often relayed by scholars, is unfortunate as it confirms the suspicion that the EU started as a vast technocratic enterprise hidden purposefully from the people. Its very origin is vitiated when in fact Monnet and other European leaders worked hard and unsuccessfully to establish a political community with fully accountable institutions in 1952 already. The project was defeated in the French National Assembly in 1954 and the establishment of the European Economic Community in 1956 indeed marked a step back from primarily political intents, but Monnet had nothing to do with this. Am I wrong to think that this matters so much? I ask my students. Memory of origins strengthens or undermines legitimacy, one student shoots back, so it does matter. This gets us straight to the question of how to remember the transition from the Soviet Union and the Russian Federation’s founding. Opinions will not be easily reconciled on this topic, conversation to be pursued in another class. Historian Orlando Figes’ The Whisperers: Private Life in Stalin’s Russia (2007) makes me revisit the issue the next day. One central character is Soviet writer Konstantin Simonov (1915-79), a Stalinist until Khrushchev’s Thaw. Simonov who supported the 1956 repression of the Hungarian Revolution, and opposed the 1968 Soviet intervention in Czechoslovakia, spent the last ten years of his life literally agonizing, privately and semi-publicly, about his role in suppressing fellow writers. He became a strong supporter of poet Nadezdha Mandelshtam and facilitated the publishing of Mikhail Bulkagov ‘s subversive The Master and Margarita. Figes notes Simonov’s ability to question himself and to “change” in the 1970s. Apparently mostly forgotten by the young today, did a Simonov prepare the ground for the glasnost of the 1980s? 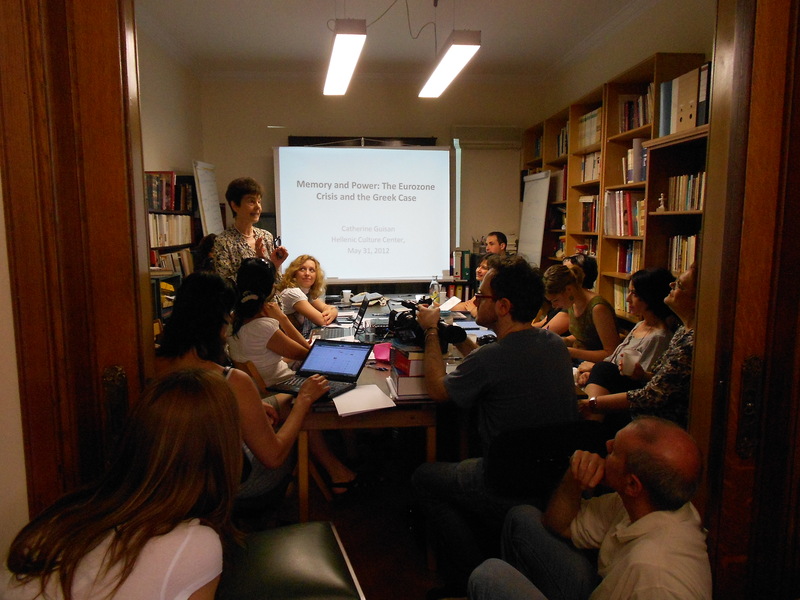 A lecture at the Hellenic Culture Center in Athens on Memory and the Eurozone Crisis. Will Greece exit the Eurozone? No one knows for sure, even after the second round of elections. But after eight weeks spent in Athens this spring I cannot countenance more loose talk about Greece in some Western media and EU leading circles: statistics do not account for lived experience. We are told that Greeks have “refused” the EU austerity program when the Greek state has steeply reduced its budget deficit in the last two years at the cost of deep cuts in salaries and pensions, with the private sector not faring much better. The so-called “bail out” consists of loaning at a profit, not giving, money to Greece. Moreover the money is disbursed by small installments, under strict conditionality, and the last disbursement in May went entirely to interest payment on the debt. A student at Athens’ Panteion University asks me, “Why were we not warned that we were not ready for the Eurozone? Isn’t this what should happen in a family?” Perhaps this should come as no surprise: the first members of the Eurozone to ignore the Stability and Growth Pact’s strictures were Germany and France in 2002 and 2003, and currently 24 out of the 27 EU member states are in non-compliance (including Germany with a national debt of around 80% of its GDP instead of 60%). Some large multinationals, such as Siemens, encouraged corruption in Greece by offering large bribes. Yes, there are plenty of problems in Greece. My modest Kato Patissia apartment was broken into on the second day of my stay here. The police building, where I lodged a complaint, looks as if it is going to fall apart, and the copy of my complaint became available only weeks later. A customer in a computer store tells me proudly how, at 42, he retired with a full military pension after serving as a doctor, and looks bemused at my amazement. Yet the visitor discovers that Greece has its share of modern heroes. A political scientist, imprisoned six years under the colonels, now heads the archival department of a major (and so far successful) Greek private bank. With his collaborators he gives seminars for archivists-in-training, and for thousands of school children who learn about preserving the past; after office hours he volunteers with a non-profit association which rehabilitates drug addicts. Two long-time Greek collaborators of Médecins Sans Frontières recently returned to Athens to raise their small children here. 50,000 donors, many of them pensioners, support the work of MSF and although donations have understandably diminished in size, the last fund-raiser for Somalia met with generous response. These women believe that, regardless of their circumstances, Greeks can keep thinking of others. So does the accountant, mother of two, who works for a large EU private transport company and volunteers two evenings a week to teach Greek to immigrants. With neighbors she helped reopen the Kipseli neighborhood’s old agora, which houses the classrooms. Professors at some of the best state universities teach, publish and organize quality international seminars (I attend several) on much lowered salaries. I take my Greek lessons at a school founded by a woman who used to prepare teenagers for the tough university entry exams. She has chosen to earn less to do more, and works with four collaborators out of her apartment; they train teachers from all over Europe in the latest foreign language teaching methods, also for immigrants, with the support of several EU grants. Finally I bow in gratitude to the hard-working shopkeepers of my neighborhood’s Laïki (open air market) and their wonderful products, who round prices downward and give receipts even for a 50 cents purchase. And I salute the Athens public transport system, its affordable monthly card and dense network of buses, trains and metro, which carry the visitor safely to her destination in a reasonable amount of time (there were no strikes in April and May). Its deficits are down, and it is putting final touches to a plan to get all passengers to pay for their tickets, at last. Not one Athenian I talked with in recent weeks denies that they have a part of the responsibility for their current plight; they must reform the state, increase productivity and repay at least part of their debt. Now that the elections are over, one wishes that highly motivated Greek and their EU and IMF fellow citizens could connect more deliberately and craft some of the imaginative and cooperative policies so desperately needed today.